Saturday, April 11, 4:00 p.m.
Intuition Pumps And Other Tools for Thinking offers 77 of Dennett s most successful "imagination-extenders and focus-holders" meant to guide you through some of life's most treacherous subject matter. Dennett deftly deploys his thinking tools to gain traction on these thorny issues while offering readers insight into how and why each tool was built. Dennett, Tufts philosophy professor and author of Consciousness explained, coined the term “intuition pump” to describe a thought experiment designed to help someone focus on the essential elements of a problem and/or to elicit an intuitive answer. His new book shows how such tools can be employed to illuminate topics ranging from evolution to free will to meaning itself. Daniel Dennett , Breaking the Spell: Religion as a Natural Phenomenon. Daniel C. Dennett, Consciousness Explained. 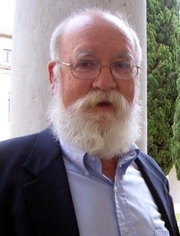 Daniel C. Dennett is currently considered a "single author." If one or more works are by a distinct, homonymous authors, go ahead and split the author. Daniel C. Dennett is composed of 9 names. You can examine and separate out names.